Ian Hook, Sydney 01/07. Bruce Dunstan, 11/10. Andrew Flower, N.Z. Derek Butcher, Adelaide. 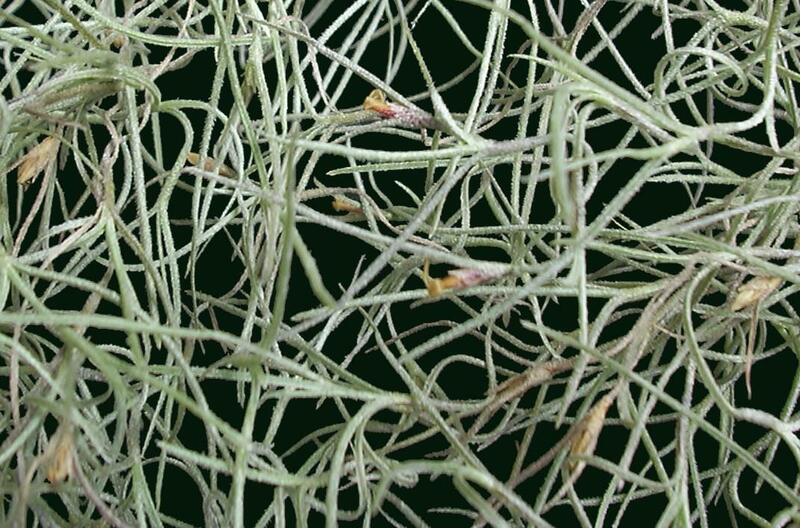 I raised this question of "weak little ochre/brown usneoides" with Uncle many years ago. He informed me he had registered it several years earlier! (See http://botu07.bio.uu.nl/bcg/bcr/index.php). 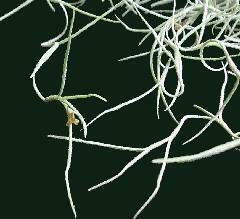 The topic has now re-appeared in the BSA Tillandsia discussion group. 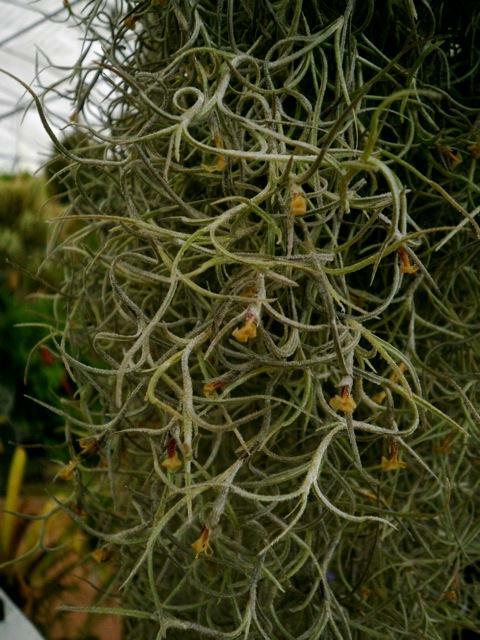 A selection from the Tillandsia discussion group discussion follows..
Chris Larson . . "I think there is probably more gold moss around than we think. I have a slide of the yellow form somewhere in the piles of photos from 1998. Where I saw it was on the road from Cuzco to Lake Titicaca. 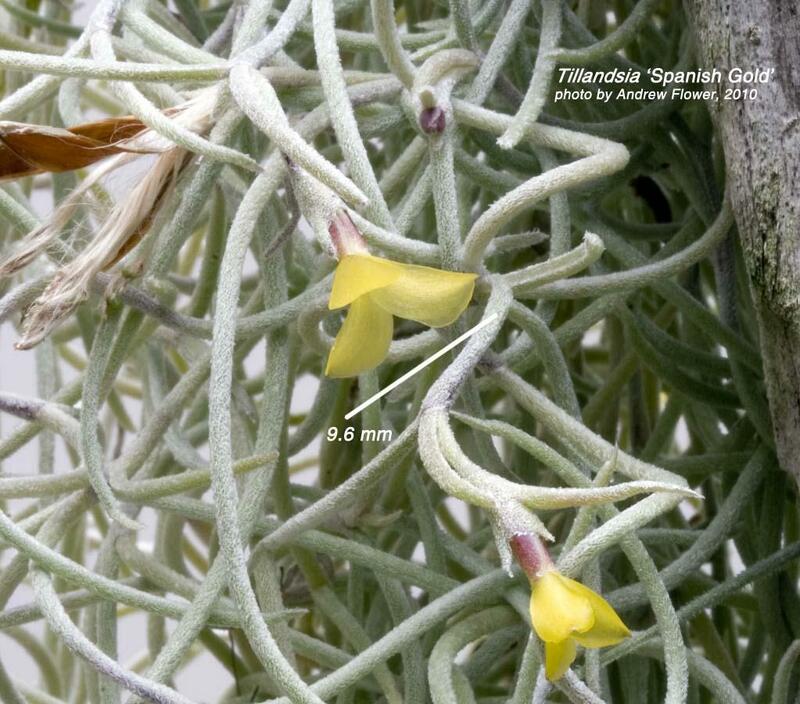 Not far from Cuzco, where the bridge crosses over the Urubamba River (on the south side within 20 metres of the bridge), was moss draped across the cutting - we were looking at a cactus underneath the moss when I noticed the colour of the flower. I think my piece must have died in quarantine. Must be a heap of collectors & tourists going here - only a cactus collector would stop at this spot though. 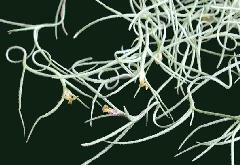 It must be only a couple of kilometers from Pisac - but who stops to check the Spanish Moss flowers ?" 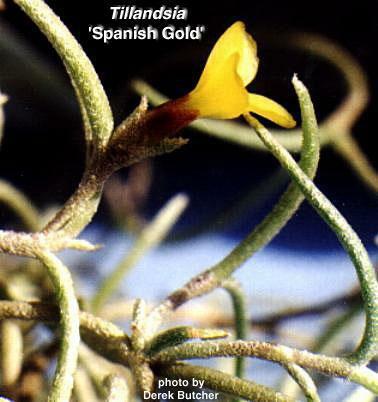 Derek Butcher . . "Perhaps it is only nutters who look for flowers but I would suggest that 'Spanish Gold' is not that common in collections. 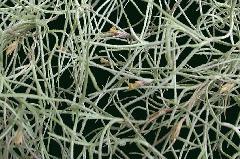 As far as I am aware the locals from Northern Chile interested in plants consider that usneoides only comes in amarillos! (yellow). This shows that this form may be endemic to this dryish part of South America. Nobody seems to have reported it from elsewhere." Andrew Flower . . "yellow-flowered 'Spanish Gold' happens to be flowering here(N.Z.) at the moment. Photo attached. Many years ago I 'obtained' a few pieces from an uncle in Adelaide. 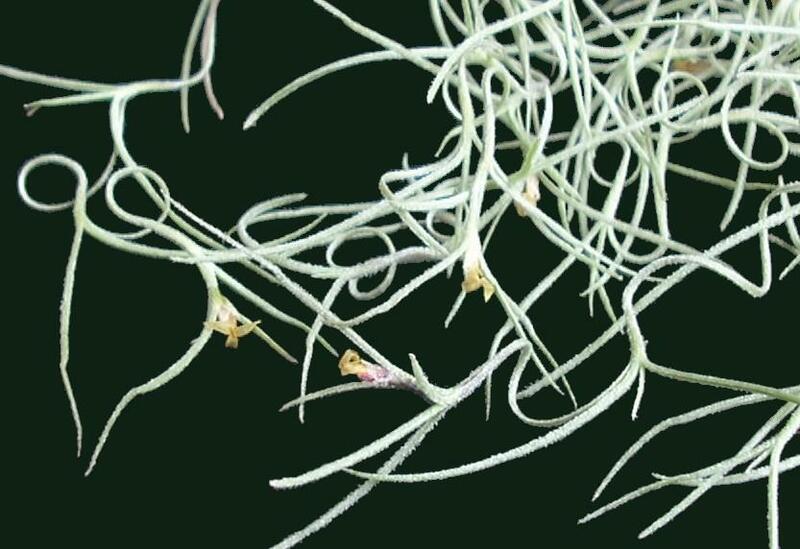 A couple of things about this one - it self pollinates, something not a single one of my 6-7 other forms of usneoides has ever done in the 40+ years I have been growing tillandsias, it flowers months earlier than any other usneoides here, and I reckon its a hybrid! Anyway, I am growing on the seed (sown 2006) to see how the seedlings come out. 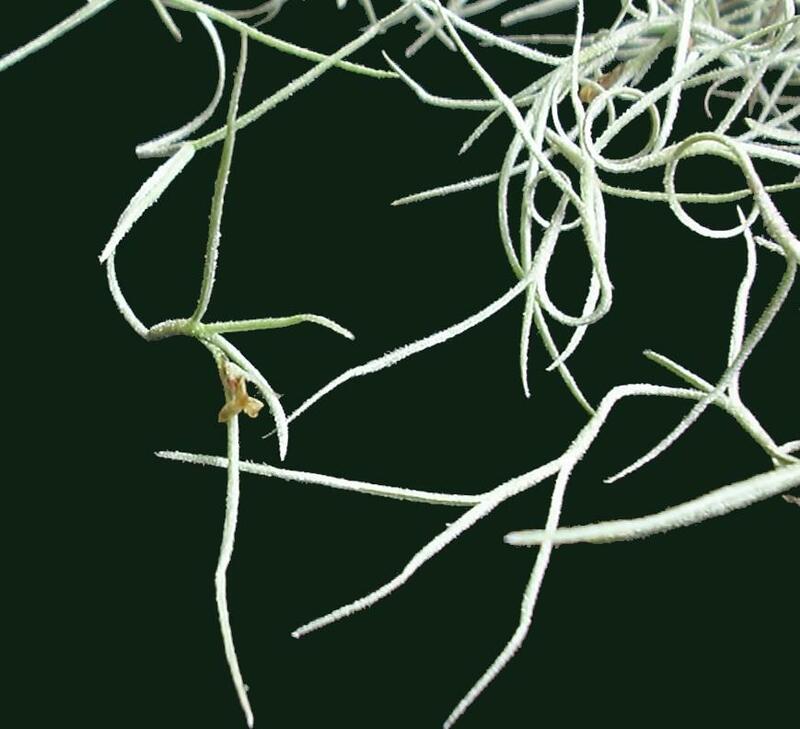 Only other time I grew T. usneoides from seed was when I wanted to establish whether the seedlings formed roots, which they did. I got that seed by and-pollinating between a medium-sized form and a large "coarse" leaved form."